I’ve just returned from an excellent panel at the NCHC Conference. “Conflicts and Solutions in Community College Honors Advising” was divided into two parts. The first half of the session focused on advising from an honors advisor’s perspective. The second half focused on advising from honors students’ perspectives. Kathleen King (Hillsborough College, Florida) gave an informative and very helpful presentation that covered ten issues addressed through honors advising. These issues include completing the required coursework (HCC’s program requires full-time honors students to take a minimum of two honors classes per term and part-time students to take at least one honors class per term), choosing a transfer school (broadening their perspective to include select universities around the country), and making sure they are prepared to successfully transfer in 2 to 2-1/2 years (fulfilling the pre-reqs for the programs and schools they are considering). King emphasized the importance of having a dedicated honors advisor to ensure persistence and completion. The advisor needs to work with the students throughout their time in the honors program. In fact, HCC honors students are required to meet with Kathleen once per term, and they cannot register for honors classes without having met with her. If they enroll in an honors class without meeting with her, they are purged from the class list at the start of the term. She advises 250-300 students and is their only advisor, addressing both their honors needs and their general college needs. 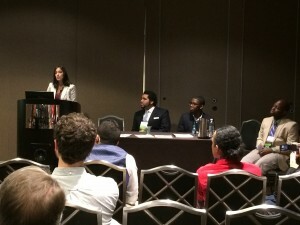 After Kathleen King’s presentation, a panel comprised of four students (LaGuardia College, New York) described their college’s Honors Student Advisory Committee. This panel was exceptional both for the professionalism of the presentations and for the work that HSAC performs on behalf of other students at the college. While the honors program has been in existence for more than 20 years, HSAC was created in 2010 to make sure that students realized they could choose from excellent colleges all over the country. They cited the NY Times article, “Better Colleges Failing to Lure the Talented Poor” as incentive. The four presenters (Vincent Sanchez, Edward Joseph, Raven Gomez, and Ronald Moore) described in excellent presentations and an engaging shared Prezi their organization’s website, year-round workshops, and transfer guide. They emphasized the importance of alumni, noting that alumni offer first-hand experience, they return to campus for an alumni fishbowl, and they also share syllabi from their 4-year schools so that students can see what the actual course load is like. This group is incredibly organized. It has an office where students can come by and review the transfer guide, and the 15 members hold regular office hours. They have also arranged college campus trips so that students can see first-hand some of their options. The panel was joined by other members of HSAC and their Honors Program Director, Karlyn Koh. For more on LaGuardia’s Honors Student Advisory Committee, find them on Facebook, visit their website, or email them at honorsprog@gmail.com. This entry was posted in Honors Advising, NCHC, Transfer, Uncategorized and tagged advising, Hillsborough CC, HSAC, Karlyn Koh, Kathleen King, LaGuardia CC, peer advising, transfer on November 9, 2013 by Ce Rosenow.